It’s almost surprising he lasted this long. Suzanna, his long-time wife (a songwriter in her own right, who co-wrote “Come From the Heart,” which her husband covered on Old Friends, and “Easy From Now On,” among other classics) died almost four years ago, in June of 2012. The next year, Clark released what may become his final album, My Favorite Picture of You. Here’s the discussion and title track. And I’m getting bloody tired of doing these postings. This post looks at differences between the hours worked, by gender, and the degree to which it could explain the gender gap. To lay the groundwork, the table below shows the number of full time employed (but not self-employed) men, women, their weekly wages, and hours worked. If this data is to be believed, on average, full time working men have a weekly pay about 21% higher than full time working women, and men work about 6.3% more hours per week. This only includes people working full time during the job, so people on leave are not included. The difference may be greater when only managers and non-hourly professionals are included, and these tend to be higher paid positions. This is a bit data, but it is the most recent example I could find – in 1999, male managers put in 14% more hours per week than their female equivalents, and male non-manager non-hourly professionals worked almost 17% more hours than women. For example, full-time men worked on average 44 hours per week whilst full-time women worked 40 hours per week. So it seems safe to note that a) on average, men are paid more per hour than women, b) on average, men work more hours than women, and c) the word “whilst” is by no means extinct in the wild, as a specimen was observed in its natural habitat less than three years ago. It should be noted that women also seem to take more sick leave than men, though that won’t be covered in this post. Now, there is the possibility that men work more hours because they are paid more, and while I believe that is part of the story, I don’t think it is the whole story. And perhaps the numbers can give us more information. Figure 2 below is similar to Figure 1, but it includes some straight line extrapolation from one week to fifty two. 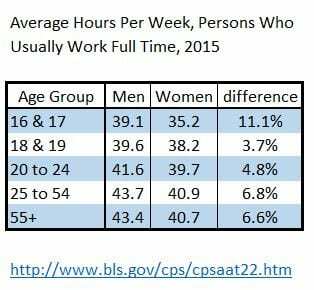 Notice that the extra 6.37% hours per week extra that men, on average, work relative to women implies that in general, men work 135 extra hours per year than women. Dividing 135 extra hours by 40.8 hours a week (i.e., the amount of hours in a typical woman’s full-time week) gives us 3.3 weeks. Thus, the average woman would need to work an extra 3.3 weeks a year to spend the same time at the job as the average man. These figures, it should be noted, assume no time taken off for leave. So how do we determine of an extra 3.3 weeks a year on a person’s career? Let us start by assuming two individuals working at the same company, with identical skills, temperaments, experience, etc. In short, assume two identical employees, except for the fact that one works an extra 6.37% hours per year. What is the effect of that extra time on one’s earnings? If two employees are identical except for the fact that one works 6.37% more hours per year, the employee who works more hours will typically accomplish a little more than the one who works fewer hours. Come performance evaluation time, all else being equal, the employee who puts in more hours will usually get a better evaluation, leading to a slightly higher raise. How much higher? 6.37% is probably a reasonable floor, given how corporate America allocates raises among employees on the basis of a pre-determined, fixed pool of money set aside for the that purpose. 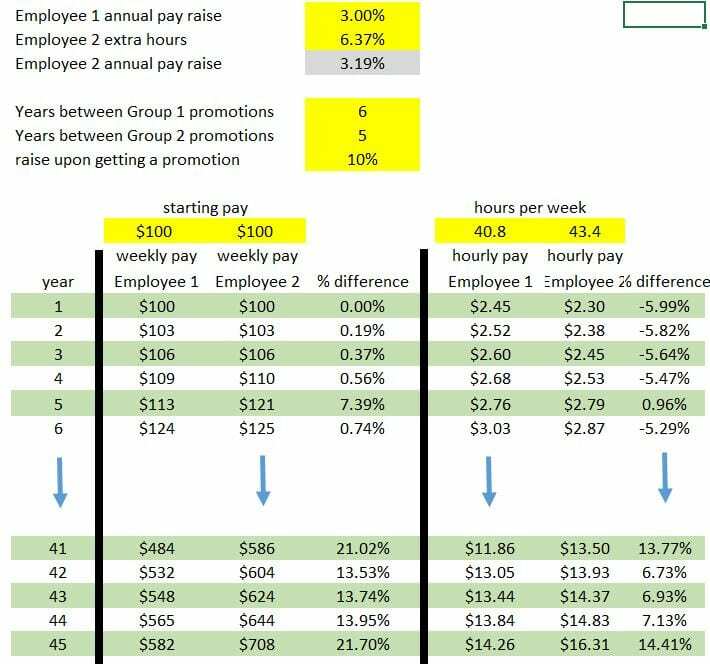 Interestingly enough, with these simple but (I believe) reasonable assumptions, at the end of their careers, Employee 2 is making 21.7% more a year and 14.4% more an hour than Employee 1, which happens to be almost precisely the difference we observed between Male and Female pay in 2014 according to the Department of Labor, which is where we got the difference in hours worked. Now, the model this is not evidence that women aren’t being discriminated against in the workplace. For one thing, the assumptions in the example above may be wrong. As an example, the 3% pay raise per year may seem on target for this year, but most people in the job market today can remember periods where raises tended to be higher. 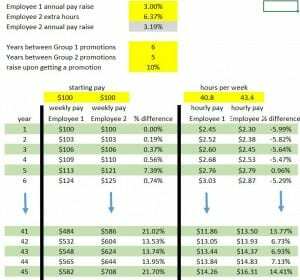 Higher pay raises imply a greater percentage differential after a few years. 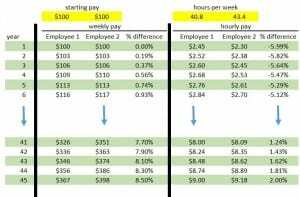 Another reason this model doesn’t necessarily show there is no discrimination is that the pay differential noted by the Department of Labor is an average for all (sampled) people in the workplace, not just of people at the end of their career. Finally, we assumed identical people with identical skills working at identical jobs. In fact, today disparate impact tests sometimes mean holding women to lower standards than men, such as when it comes to physical tests for joining and remaining in the military or various firefighting units. Additionally, there are separate leagues or tournaments for women that aren’t open to men in activities such as soccer and basketball. Interestingly, “women only” events exist in non-physical activities such as poker and chess, and affirmative recruitment projects to steer women into careers where they have been under-represented numerically, such as computer programming or mathematics are mainstream, if not ubiquitous. All of this ensures that in America today, women have a lot more opportunity than they did in the past, and this is a good thing. But the difference in hours worked may make it hard to come up with an outcome everyone deems fair. 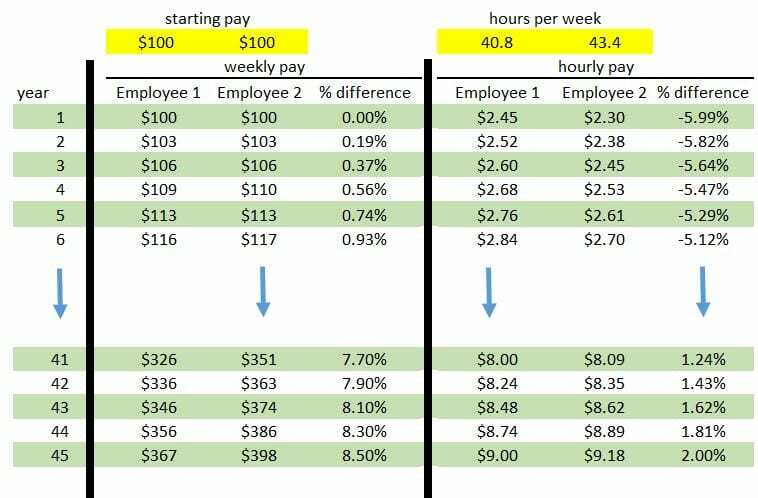 For example, in Figure 4, while Employee 2 ends up being paid far more than Employee 1, Employee 2 actually gets paid less per hour for many years, despite accomplishing more throughout the year. 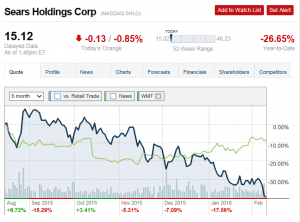 (Would Employee 2 choose to remain at that particular job under those circumstances?) On the other hand, if both received the same hourly pay in year 1, weekly and annual disparities in pay over time would only increase. Therefore, assuming all else is equal, for the wage gap to truly become zero, so will the hours gap. And based on the table below (with data from this table produced by the Department of Labor), perhaps that will happen (although the figures for the youngest demographic may point to something else). Another thing that may have to change for there to be full gender equality in wages is for the two genders to select the same types of jobs. This table, which shows women as a percentage of the total workplace plus women as a percentage of various occupations, makes it clear that women tend to be under-represented in many of the higher paying blue collar occupations, such as working on oil rigs, pipelines or electricity transmission lines. (These are also typically more dangerous jobs, explaining in part the fact that a man at work over 10 times more likely to die from a job related injury than is a woman at work.) Additionally, men and women also have very different rates of self-employment. In any case, I’m happy to share my spreadsheet. If you want it, please email me at my first name (mike), dot, my last name (kimel) at gmail, dot, com. Because I’ve been getting a spate of requests for spreadsheets associated with posts that are more than five years old lately, and since I’ve changed my computer twice since that time, I’ll add a caveat: I reserve the right not to go digging for the spreadsheet if the request comes too long after this post is published. As with William Shakespeare, born and died on the same calendar day. Not the same one, but had the same effect on Toronto, ON, that this one did on Deadwood, SD Saint Joseph, MO. I assume that means almost 1/5 of the U.S. energy supply 55 years ago was from lumber. Erik Loomis can tell you what happened next. ETC: bob in Comments notes that I managed to ignore hydroelectric as a renewal power source. Anyone still taking advice from my 2008 article about water investments in Institutional Investor is appropriately cautioned. My favorite data point in a quick perusal: From its 2010 peak to 2014, DoD-Military spending dropped from $690,469,000,000 to $581,456,000,000. Even if you assume the lowest-range economic estimate of waste for military spending, that’s a real economic gain of around $32.7 billion, or just under half of the total spending on Education. Private investment could be increased by lowering the interest rate with monetary policy, but since the interest rate is as low as it can go, this won’t be effective. Another solution is to raise private investment through mechanisms such as tax incentives. 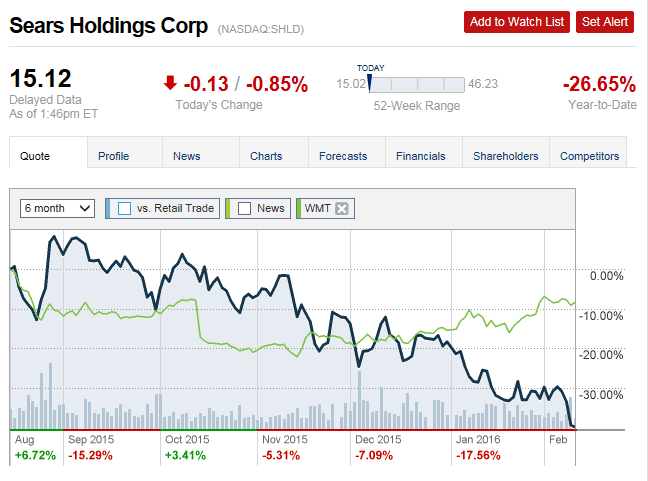 But in a stagnating economy, business confidence is low, and it’s unlikely this will have much of an effect. It’s worth trying, but it’s unlikely to be enough. Yet another solution is to raise public investment; infrastructure spending is a frequently mentioned candidate. This is attractive for two reasons. First, investment in U.S. infrastructure has been lagging, which needs to be addressed independent of the secular stagnation problem. Second, while tax incentives amount to leading a horse to water and hoping it will drink, government investment is determined by fiscal policy. It can be whatever value Congress and the president want it to be. Give Mark extra credit for being one of the few economists willing to say publicly that Excess Reserves are not “investment,”** even as he hedges whether “secular stagnation” is the current reality. **He doesn’t take the next step and state that IOER is being paid because banks are insolvent and robbing the Fed is a victimless crime, but we shouldn’t expect everything.